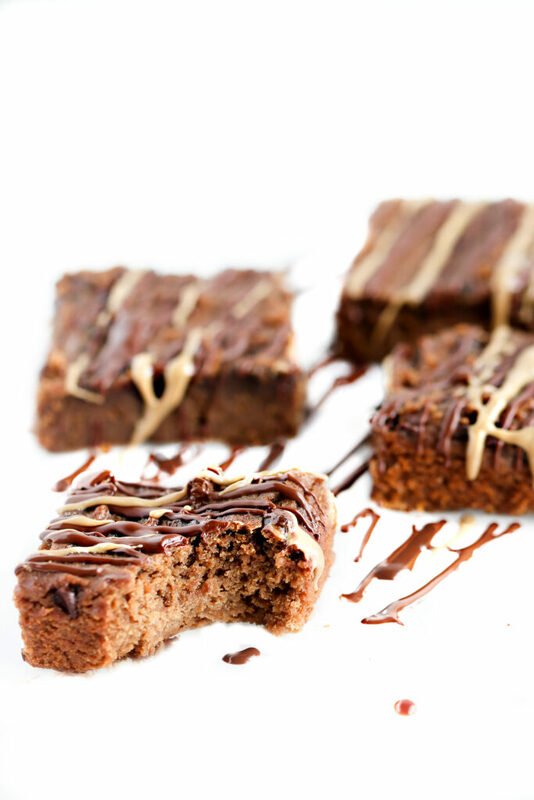 These SunButter Chickpea Blondies are gooey, delicious, and made with no refined sugar.They’re nutritious enough to enjoy as snack and decadent enough for dessert! 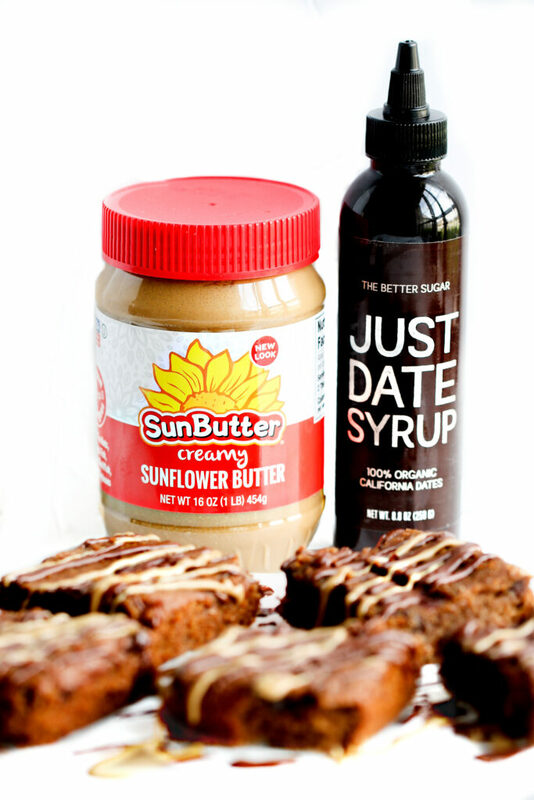 This post was created in partnership with SunButter & Just Date Syrup. All opinions are my own. 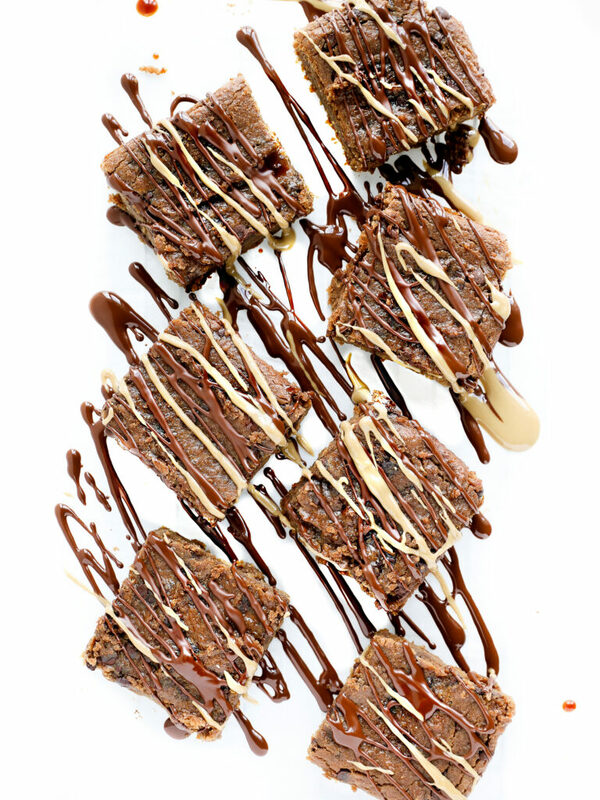 And these healthy blondies also happen to be flourless, gluten-free, allergy-friendly and vegan, too. I know you’re probably questioning this entire recipe, wondering how it’s even possible to make such a dessert without any of those ingredients.Well, let me give you a hint… chickpeas. Actually, that was more like the answer, but I’m the girl that likes to read spoilers before the end a movie, just so I know if I want to keep watching it.That being said, you really want to keep watching how this happens. 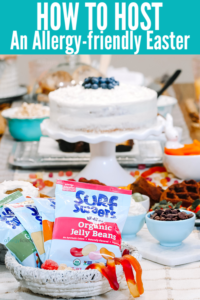 Take one look at this blog or my instagram and you’ll see just how much we love our sweets. From cupcakes to brownies, and donuts to cookies….it’s all good. 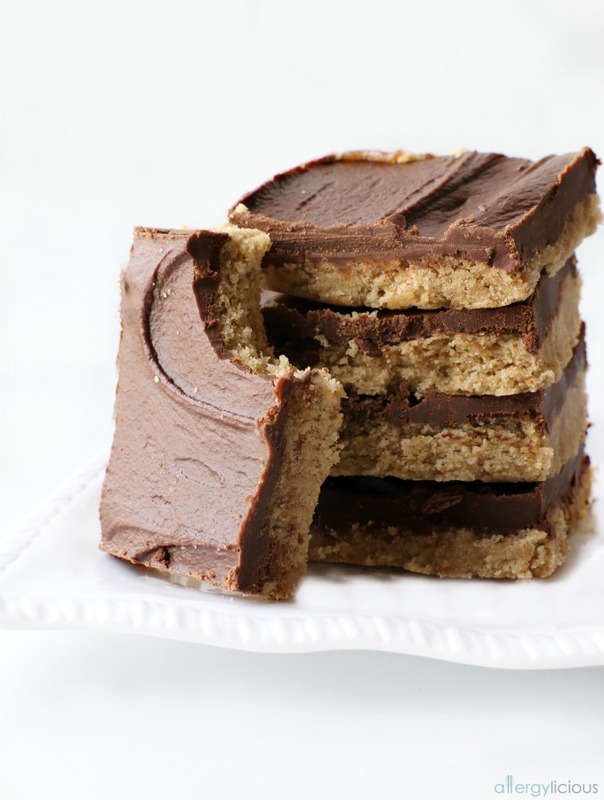 Because these recipes avoid our allergens, we consider them healthy. We also use sugar alternatives or unrefined cane sugar because it’s better just for you. The one thing we haven’t done a lot of is baking flourless treats. See … nothing weird, nothing that requires Google to translate. Just simple plant-based ingredients that come together in the most magical way. 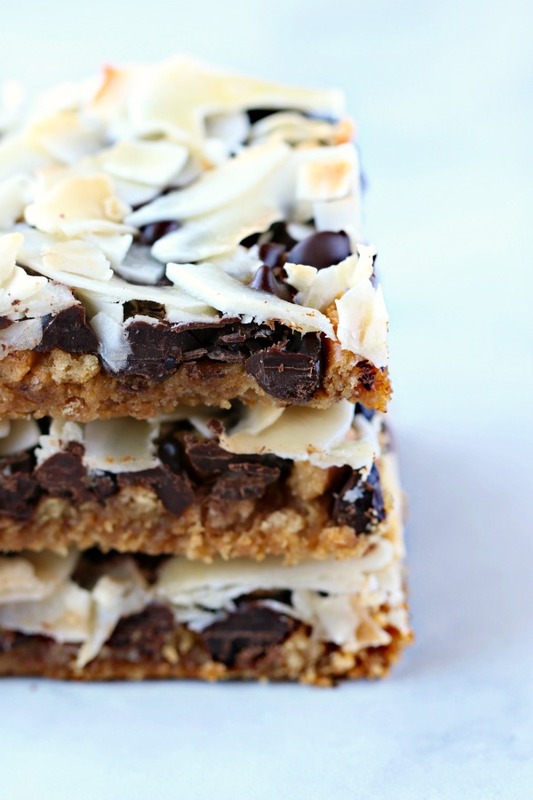 These are so easy to whip up and can be in your belly in no time! Simply toss everything (except the chocolate chips) into your blender (or food processor) and blend away! It takes 5 minutes prep and 30 minutes to bake. 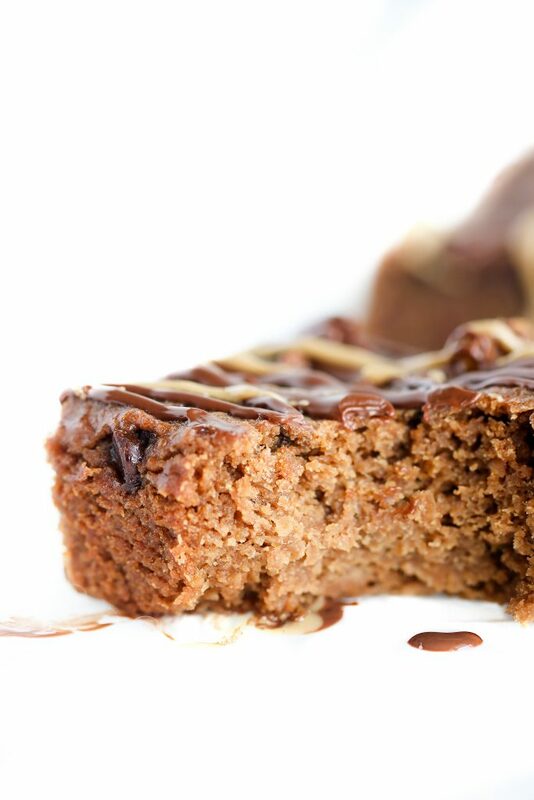 Which means that you can have a deliciously healthy dessert ready to eat in no time! I tested this recipe quite a few times to get it right before sharing it with you all. So to save you from all the trials and errors, I recommend making it as written for the best results. However, here are a few possible substitutions for those who have different restrictions. Garbanzo Beans: Great Northern Beans (white beans or Cannellini beans) also work in this recipe. However, chickpeas are my favorites! SunButter: There are several types of SunButter available, such as Organic, Creamy, or Natural and any of those would be a great choice. 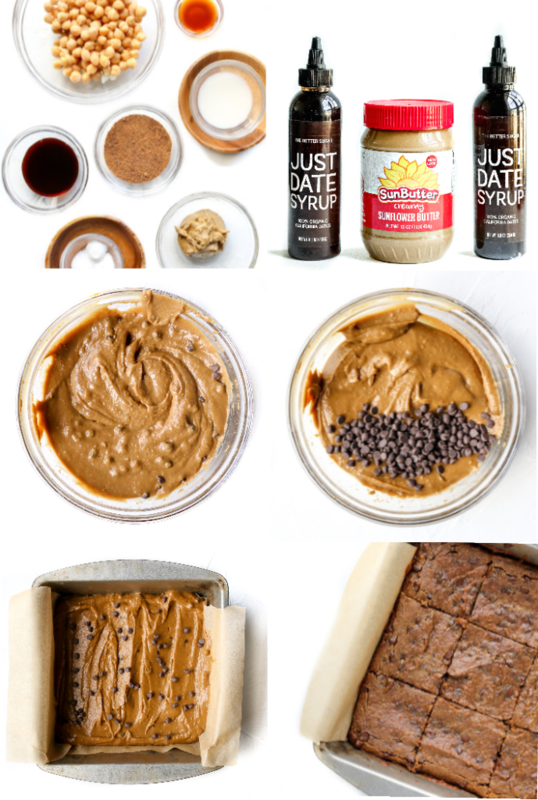 I honestly haven’t tried this recipe with any other nut or seed butter. We have an allergy to nuts and this is by far our favorite allergy-free brand but I am guessing that any all-natural variety would work well. 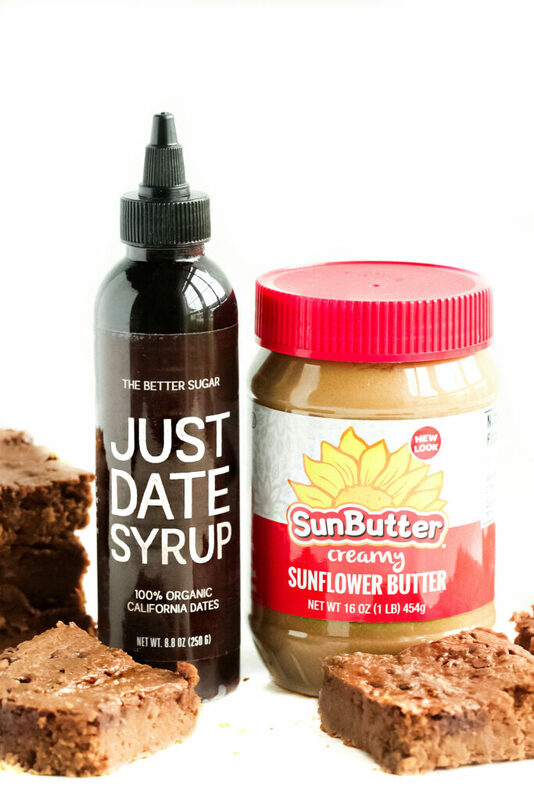 Just Date Syrup: This is a new product that I love baking with and highly recommend grabbing some to try. It adds the perfect amount of sweetness. But in a pinch, use pure maple syrup to keep it vegan! Coconut sugar: Granulated sugar works well in this recipe too. 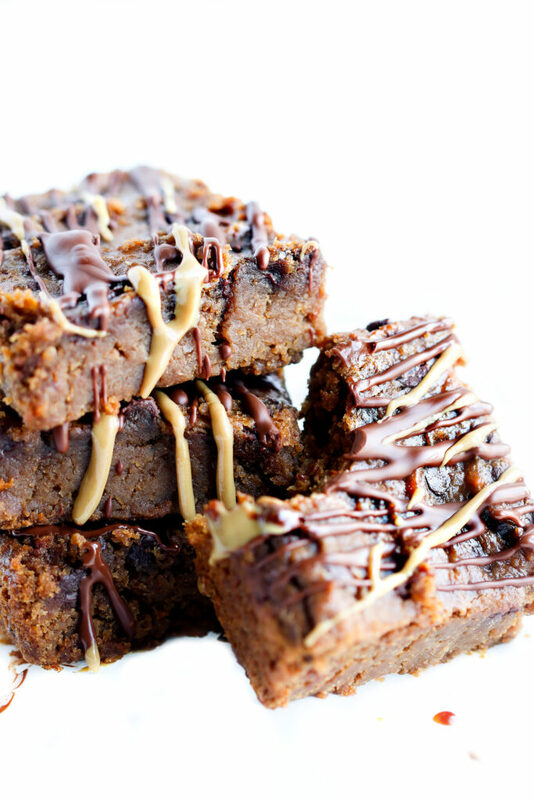 But to keep the recipe unrefined without compromising taste, coconut sugar is a great choice! Flax milk: Any non-dairy or regular dairy milk work. Just pick whichever fits your dietary needs. Chocolate Chips: Depending on the type of chips you select, will determine if this recipe stays 100% refined sugar free. You could always leave them out….but why? 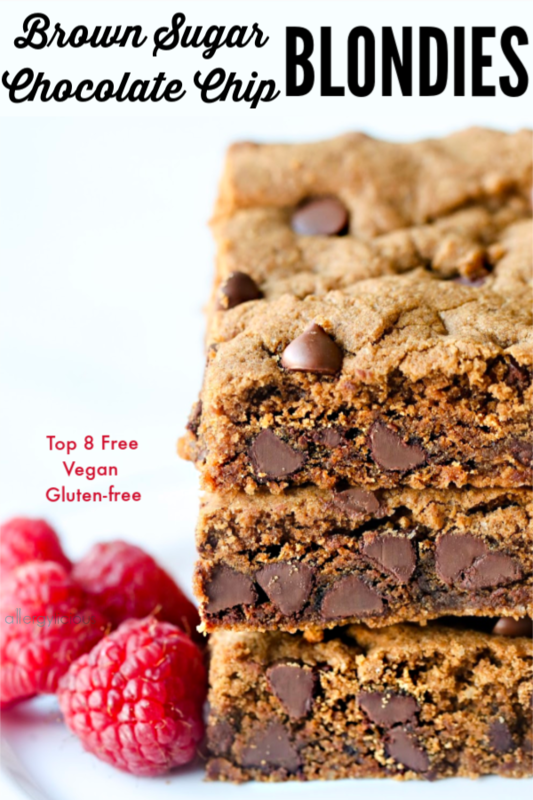 These Chocolate Chip Chickpea Blondies are perfect for anyone who needs to satisfy their sweet tooth but in a healthier way. 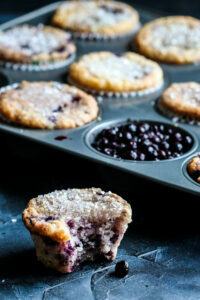 And since I’ve already eaten them all, it’s time to run to the kitchen and start baking your own batch! I am going to make these!! Where do I enter for the giveaway? The giveaway is on my instgram account. One question. 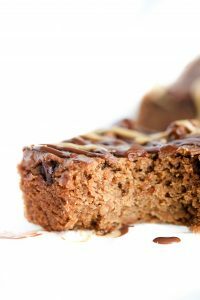 I was making a blondies recipe (not this one, but this recipe is definetly something happening in the near future) and it had Cannellini beans in it (for the flour, I’m guesssing). About 20 minutes after coming out of the oven, they started turning green! It didn’t effect taste or consistency, but was was wondering if you’ve had any experience with that while baking with beans. I’m assuming it the same thing that happens when baking soda mixes with a legume. It can happen when baking with SunButter as well. 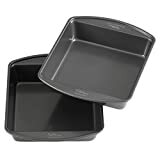 Typically, you can add a splash of lemon juice or decrease the amount of baking soda and powder by 1/3. It shouldn’t happen with my chickpea Blondies (I tested them 5x before posting) but if you’re using another recipe, I’d start with the lemon juice.